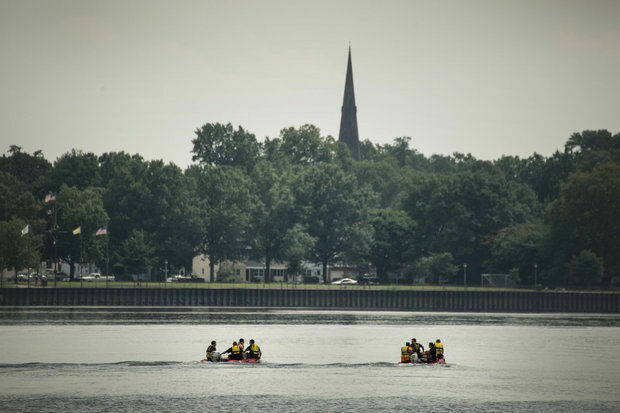 TRENTON – Trenton firefighters rescued three Pennsylvania residents from the Delaware River after a tubing accident left them pinned against a tree Sunday afternoon, officials said. A husband and wife, both around the age of 60, and their stepdaughter, 24, were tubing near Rotary Island close to Trenton when the current became too rough. They were thrown from their tubes and pinned against a hanging tree close to Yardley, Pa., Trenton Fire Chief Frank Seidel said. “The current pulled them in and sucked them against the tree,” Seidel said. Seidel said the department was alerted to the incident at 2:18 p.m. Sunday. He said initial reports were that the victims were on the New Jersey side of the Delaware River but once on scene the fire department’s rescue team learned the three victims were closer to Pennsylvania. “Once we figured out where they were, it took about an hour to get them out,” Seidel said. About 20 fisherman on the Pennsylvania side had also gathered to try and save the tubers, Seidel said. The three victims suffered no serious injuries but were taken to a Pennsylvania hospital as a precaution. The victims’ names were not immediately available. The fire department handed them over to Pennsylvania authorities.